Pilot has often used its anniversary pens as a benchmark for new models. Later on, those editions, albeit with some minor modifications, could become regular and unlimited models. A very obvious example was the Custom 65, which was also the first real anniversary pen by Pilot. This pen was a limited released in 1983 on the occasion of the 65th year of the company. Two years later, a simplified Custom 65 became the Custom 67. And even later (1992), it became the Custom 74. Pilot Custom 65. Note the wide cap ring and the textured surface. In 1993, Pilot celebrated its 75 years of history. Such a big accomplishment deserved a big pen—the 75th Anniversary pen. It was a flat-top made of ebonite –coated with urushi lacquer— and plastic. It followed the line of the “vest” models from the late 1920s and 1930s. An interesting feature of this anniversary pen was the implementation of the very traditional “kikuza” (chrysanthemum) clip present in many a pen –and not only by Pilot— in the 1930s, 1940s, and 1950s. A kikuza clip of a pen from 1937. The 75th Anniversary Pilot in its box. 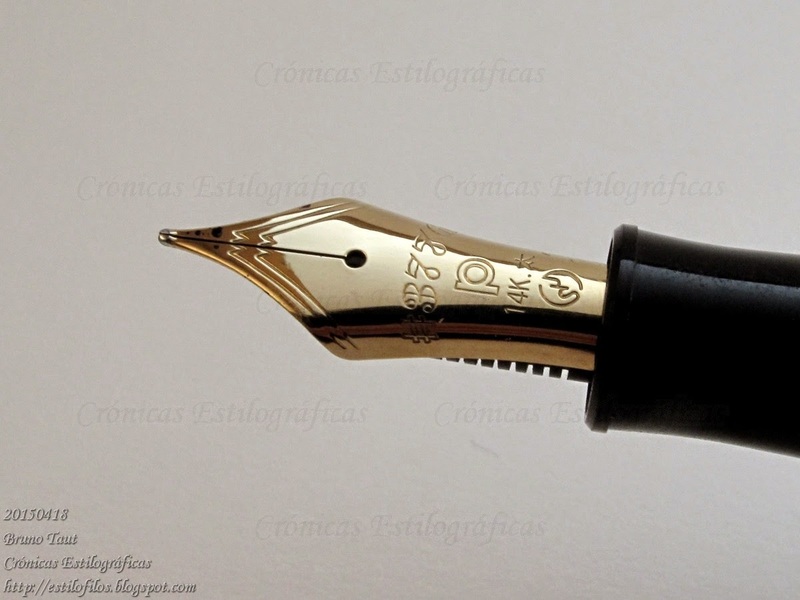 Pen-wise, this unit carries a 15-size nib made of 18 K gold with a unique engraving. M was the most usual nib point, and F and B were also available by request. The feed, as is the case with all modern Pilot pens, is made of plastic. The filling system is through the well-known Pilot proprietary cartridges and converters. A CON-70 converter, painted black, was included in the package. The insides of the pen--the black painted CON-70 converter. On the pen body, it is worth to note the bicolor nib and the rings on the cap and on the body. 7500 units were made at a price of JPY 50000. 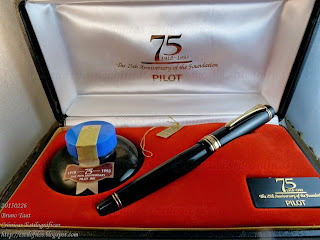 But that is not all—the 75th Anniversary pen had an obvious descendant—the Pilot’s flagship Custom 845. By the end of 2002, about 200 units of this new pen were released at some department stores in Japan as a response to a demand for a luxury pen. It was initially made to order and its price was, again, JPY 50000. It took some time to become successful, but finally it was included as a regular model in the standard catalog. Blue Custom 845--a special edition made for Maruzen stationery in 2014. Note that not the whole pen is painted in blue. The black parts --section and the ends of body and cap-- are made of black plastic. This is also the case on the 75th Anniversary pen and on the regular Custom 845. Note also how the nib, the rings and the clip are different with respect to the original model from 1993. The Custom 845 showed some variations over the 75th Anniversary pen. The kikuza clip was replaced by the simpler standard ball clip of most Custom models. The rings adorning the pen were also modified, and the nib was stripped from any reference to the anniversary it initially celebrated. The materials and areas coated with urushi remained untouched. And the price has not changed in over 13 years of production. However, needless to say, the limited edition preserves its value a lot better than the current 845. Such is the market of collectibles. My thanks to Mr Noguchi.